Ars Poetica International Poetry Festival is each year presenting a wide spectrum of poetics from all over Europe, as well as other countries from all around the world. Internationally renowned authors, whose work has overcome national borders will be on stage with their unique poetics and their amazing art in performance. "For 15 years, we've been trying to develop and maintain a level of quality at our festival, securing it a firm spot on the map of prominent European international poetry festivals," says poet and creative director of the Ars Poetica International Poetry Festival Martin Solotruk. "As for the highlights, we are thrilled to welcome the Canadian-Nigerian poet and one of the most talented international performers Titilope Sonuga, whose performance will take place on November 17." As Solotruk further mentioned: "Titilope giftedly grips the audience and constantly keeps them engaged and excited, as if she was a rock star." The visitors of the festival can look forward to the opening night of the festival taking place on November 16 at V-Club located on the SNP Square in Bratislava. Seven international and local authors of poetry, will be introduced to the vide public, including a representative of the contemporary older/middle generation of Slovak poets, Ján Štrasser, who has recently published a new book of collected poems. His civil poetry has an irreplaceable role on our poetic tradition. The highlights of the evening include a performance by the exceptional contemporary German poetess Sylvia Geist and a show by the Finnish artist Vesa Haapala. The first festival evening will be topped off with a concert by the Czech-French musical duo Tara Fuki, whose work connects poetry with unconventional musical forms. Don't Miss the Ars Poetica Versopolis Night! You should definitely not miss the evening of European Poetry Versopolis on November 18 at 6pm in the SNG Berlinka Café. Versopolis is the sole European platform dedicated to poetry. It unites thirteen prominent European festivals, including the Ars Poetica International Poetry Festival & Publishing House. At this special event, we will present five noteworthy European poets – Laura Accerboni (Italy), Julien Delmaire (France), Nora Gomringer (Germany), Semier Insayif (Austria) and Lies van Gasse (Belgium) along with two additional stars of contemporary Slovak poetry, Michal Habaj and Eva Luka. The program will lead into a multimedia show by one of the most gripping artists of contemporary German poetry, Nora Gomringer and Philipp Schold and their formation called PENG! There is definitely a lot to look forward to. At the festival, world poetry will also be read in original translations by distinct Slovak actor personalities such as Lucia Hurajová, Marek Majeský and Ivan Šándor. Every poetry night will be a multimedia and multi-genre experience. Live VJ sets by Zdeno Hlinka also create an added value; a new dimension of experiencing poetry. Apart from this, Ars Poetica includes a rich selection of off program events, whether it is our Ars Poetica Film section compiled by Martin Palúch taking place on November 21-24 in the Lumière Film Theatre, or a selection of workshops included in the Ars Poetica Academy program. Ars Poetica International Poetry Festival is for example hosting a special workshop by the Amulet studio, where children can learn to create their own unique poetry book. 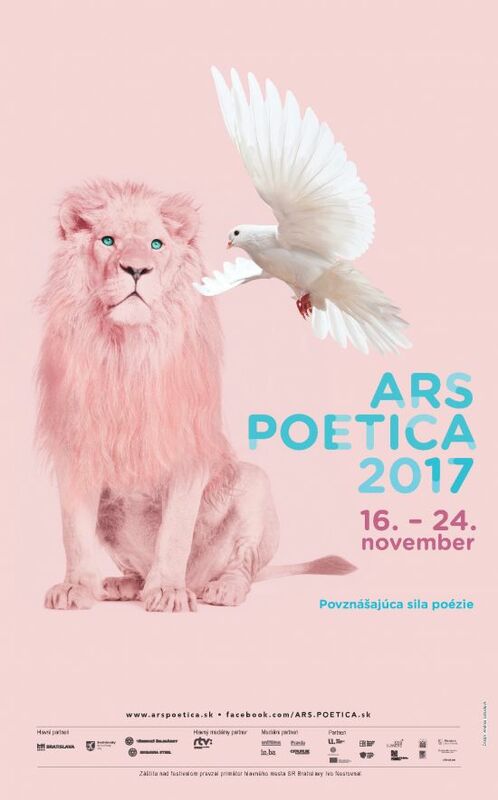 Ars Poetica Academy program will take place in the Lizst Pavilion section of the Bratislava's University Library on Saturday, November 18, between 10.30am and 1pm. And just a reminder – Ars Poetica keeps the majority of its events free of charge.